Being an educational institution with a history dating back to the 17th century, it would have been easy for Adams’ Grammar School to rely on tradition. Instead, they decided to embrace technology to improve their students experience and resorted to digital signage to communicate with students, staff and parents in their locations. 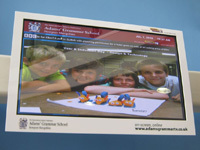 The digital displays powered by digitalsignage.NET and provided and installed by Chamber TV helped them reinforce their image of a forward- looking institution as well as promote the multitude of extra- curricular activities that their students can enjoy. By using digitalsignage.NET, the school is now able to stream videos of its theatre performances and special events as a way to raise awareness about those and encourage students to get involved. 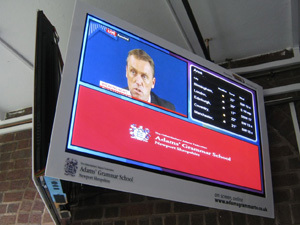 Being a cloud- based digital signage solution, digitalsignage.NET relieved Adams Grammar School from the task of buying and maintaining servers which considerably decreased the total cost of the install and made the system much easier to use. This entry was posted in and tagged digital signage, digital signage advertising, digital signage for education by Dynamax. Bookmark the permalink.